TV Magic O'Connor Make Your Antenna Troubles History! Hi, I'm your local TV Magic Technician Carl in O'Connor. One of the most common complaints I hear from my valued customers is that they are having problems with their Antenna or reception, and this is no surprise, because antennas are vulnerable to a great many things; wear and tear, bird damage, strong winds, falling branches...so many things can cause your antenna to stop wokring as it should and interrupt your favourite TV shows. Sometimes this can be a real inconvenience, but more than that, having no TV coverage takes away our relaxation and chill-out time. When you're a hard-working, O'Connor resident, it's likely that, you're so tired when you return home, that you don't have the energy to do any other enjoyable activity than watching TV. TV is one of those truly wnderful things that allow you to experience interest and excitement without you having to exert any energy. So when it stops working, our houses can turn a little chaotic. But don't worry, that's why I have a service especially for you; TV Magic Antenna Installation. The Burgers Might be Better at Hungry Jacks, But The Antennas are Better at TV Magic! There are all kinds of services that you seek out, for the sole reason that their product is better or more reliable than that of their competitors. When you want a good burger, you go to your favourite burger place. When you want a good builder, you shop around to find someone skilled and reliable. And it's no different with the TV Antenna business. There are some services that will make a mess of your Antenna job and then you'll have to pay to get it fixed later anyway. 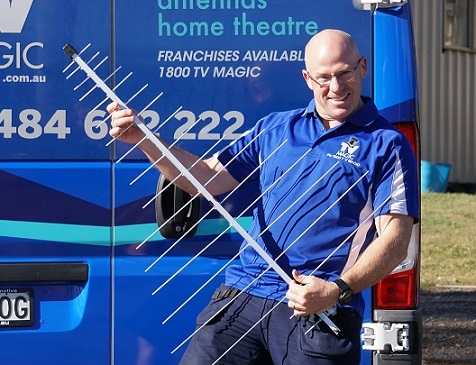 At TV Magic Clunes, I do the job right the first time, every time so you don't have to worry about replacing you antenna in 5 years. TV Magic Antennas are specially sourced for quality and have an estimated life span which is 3 times that of a normal antenna. So why waaste time and money on a service that's not going to get you the results that you deserve? Call TV Magic Clunes today!